The construction site where we excavated as part of the Origins of Doha Project. At some point I decided that it would be a great idea to book a flight from San Francisco to Doha, Qatar on the day after the end of the Fall 2012 semester–my deadline to file my Ph.D. A week later, I’m mostly recovered from that last, big push to finish, cleaning out my apartment for my subletter, partying beyond all reason at Cheyla and Nico’s house, and hopping a jet to fly 8,000 miles. 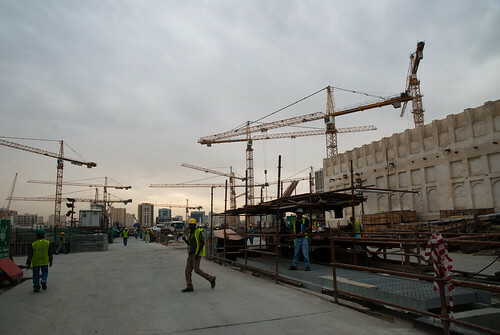 As is my current pattern, I got in for the last week of work at the Origins of Doha Project’s site in central Doha. We hope to work a bit more at a different site in January, but we’ll see. The site is a giant, chaotic construction zone with 5,000 construction workers going everywhere all the time and 19 tower cranes whirling overhead. 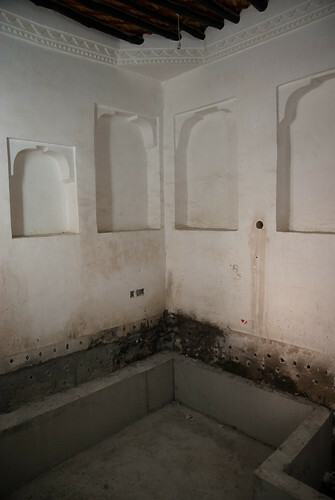 The insides of one of the heritage houses stripped out and lined with concrete. Most of the archaeological remains are long gone, but there were a few “heritage” houses that are being preserved, though they’ve been heavily restored twice and are pretty disturbed. These heritage houses are becoming a museum and are being cleared out to accommodate air conditioning and other modcons, so we were brought in to record what was left of earlier builds of the houses. 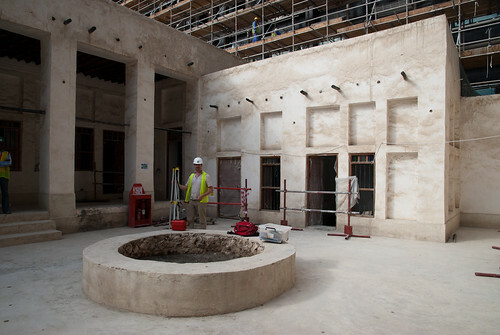 The exterior of one of the heritage houses, excavation director Daniel Eddisford for scale. I helped my friend (and former Zubarah colleague) Kirk dig and record a little bit, spending an inordinate amount of time on an isometric sketch of a blocked concrete drain setting next to a well and a bath inside of a house. The team had been digging for a couple of weeks–I was surprised to find that this was the first archaeological excavation performed in Doha. Cool. 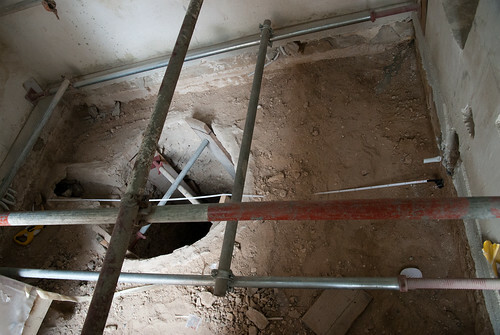 We returned to site the next day to record a couple of wells in a different heritage house. The well. A bit difficult to record, yeah? There’s dirt over the measuring tape so I don’t trip over it and fall into the well. This is the well I recorded. The utility of drawing is probably pretty obvious in this case, as you can’t get a good photograph of the well with all the safety scaffolding in place. I pounded a nail in the eastern wall with my trowel and strung a line across the room. The houses are on a North-South orientation, so it made drawing the multicontext plan easy. There was a later soak-away coming in from the western wall that I also recorded. A soak-away is basically a drain coming from a toilet. The well was over three meters deep and didn’t smell, thankfully. My kit in the doorway, with my unfinished multicontext plan. It was still really awkward to move in the room and I tried to spend as little time over the well as possible and still record it. 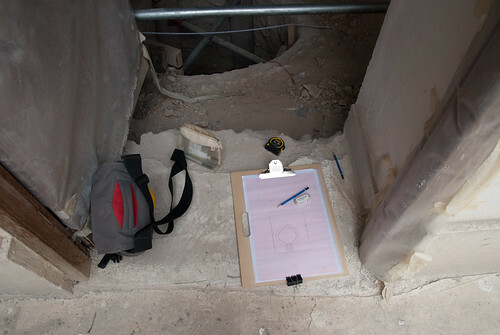 It was urban rescue archaeology all the way–dodging bulldozers and improvising the best way to record fairly trashed stratigraphy as quickly as possible while still producing the best record we could for the archive.